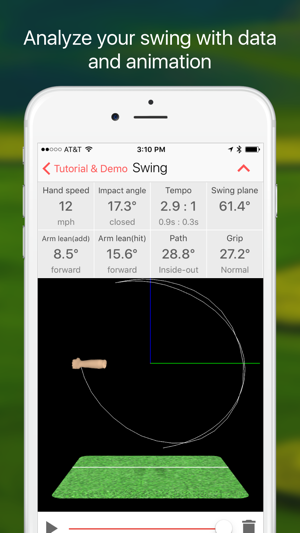 TrackMyGolf delivers a golf swing analyzer right on your wrist. 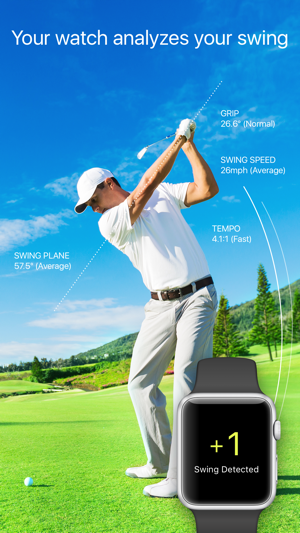 Watch your golf swing at up to 100 samples per second, as captured by the built-in motion sensors of your Apple Watch. There’s no extra hardware to buy (similar products sell for up to $150). An Apple Watch is required in order to capture your golf swing analysis. - A number of data reported including hand swing speed, tempo, swing plane, impact angle, swing path, grip angle, and golf swing power. - No Internet connection required during swing. Your golf swing analysis saved to cloud when the phone is connected to the Internet later. This golf swing trainer tool is extremely helpful in visualizing your arm movement through the swing. For example, you can visualize how your arm cross over through the impact zone. Another use of the Apple Watch golf swing reader, if you tend to cast early, you can visualize your arm pushing out and swinging outside in to compensate. - No calibration, no set up. 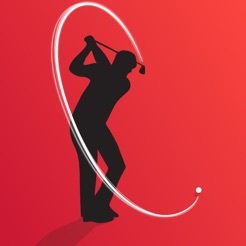 Start the golf swing trainer app and play. - No switching. No need to switch the sensor when you switch the golf club. - No extra weight. Nothing is attached to the shaft, so your golf swing power and form are never affected. You can even use it on the golf course to capture your game swings. Please make sure you sign in to iCloud on your phone. 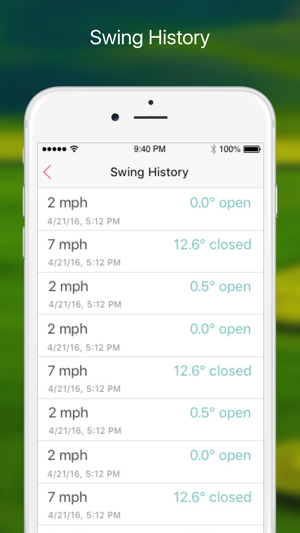 This app stores your swing in iCloud so that you can visualize it on phone and review later. Limitations: Because the sensor location is on your wrist, you will not see problems associated with your hand. For example, if you flip your hand or un-hinge too early, you will not be able to visualize the problem. However, a hand flip is usually a result of compensating for an early arm casting, so you can get a hint from your arm trajectory. We appreciate your feedbacks. If you see a problem or have a suggestion, please do not just leave a negative rating (yes 4* is a bad rating, we have a high standard :-)), because we have no idea why. Tell us the problem so that we can improve the product. Better yet, email us directly at support@vimo.co. Like other reviews have mentioned, we provide a speedy support, we typically respond within 30 minutes. I have only been playing this wonderful game now for a little over a year following lessons at my local driving range. These lessons teach you the standard day to day points of golf, stance ,grip etc and set goals for next lesson but as a new player eager to learn and practice we all try and all make mistakes without the knowledge of why? This app gives you these answers and more! My wife brought me this for Christmas after watching me looking at the website. My practice now is more focused, each shot is measured for me to understand and correct. Instruction is available to aid in different approaches to looking at the issues instead of someone saying try again. I'm proud to wear this and within 5 weekends change my golf so much that people around me think I've been in on a golfing training holiday! TrackMyGolf is simple to use, understand and more importantly will help you change your game! Upon downloading the app, I connected it to my watch. Then started a session. This is where I found out that it isn't doing anything. First off, when I start a session on my watch, it tells me to connect to iCloud. I already am. Then it won't save any swings. It gives me the option on my watch, hut where they go, I have no idea. Also, on the app from my phone, it doesn't give any options other than tutorial, history or settings. In tutorial, it simply tells you how to start a session. History, doesn't do anything because nothing is saving to it. And finally in shop/settings. It gives the option for upgrading to "premium." Well, that didn't do anything. And in settings/tips and tricks, it opens tips for a whole different app. It gives tips for "Track My Golf." If someone will get in touch with me, I'll change my review. please send email to support@vimo.co so we can help you out. After getting my Apple Watch series 2, I've been searching for this kind of app and finally found this app. It works well more than I expected! I'd like to suggest somethings for making it better. 1. Choose 'Club' in Apple watch - Currently I can only save the swing in apple watch and then I can choose 'Club' in iPhone app. it would be better to set 'club' on watch app before saving swing.